Gjøa was the first vessel to transit the Northwest Passage. With a crew of six, Roald Amundsen traversed the passage in a three-year journey, finishing in 1906. The 70 by 20 ft (21.3 by 6.1 m) square-sterned sloop of 45 net register tonnage (4,500 cu ft or 130 m3) was built by Knut Johannesson Skaale in Rosendal, Norway in 1872, the same year Amundsen was born. She was named Gjøa after her then owner's wife. (Gjøa is a modern form of the Norse name Gyða - this again is a compressed form of Guðfríðr, a compound of guð 'god' and fríðr 'beautiful'.) For the next 28 years the vessel served as a herring fishing boat. On March 28, 1901, Amundsen bought her from Asbjørn Sexe of Ullensvang, Norway, for his forthcoming expedition to the Arctic Ocean. Gjøa was much smaller than vessels used by other Arctic expeditions, but Amundsen intended to live off the limited resources of the land and sea through which he was to travel, and reasoned that the land could sustain only a tiny crew (this had been the cause of the catastrophic failure of John Franklin's expedition fifty years previously). Her shallow draught would help her traverse the shoals of the Arctic straits. Perhaps most importantly, the aging ship was all that Amundsen (who was financing his expedition largely by spending his inheritance) could afford. Amundsen had little experience of Arctic sailing, and so decided to undertake a training expedition before braving the Arctic ice. He engaged Hans Christian Johannsen, her previous owner, and a small crew, and sailed from Tromsø in April 1901. The next five months were spent sealing on the pack ice of the Barents Sea. Following their return to Tromsø in September, Amundsen set about remedying the deficiencies in Gjøa that the trip had exposed. He had a 13 horsepower marine paraffin motor driving a single screw installed. She had hitherto been propelled only by sail and had proved to be sluggish. Much of the winter was spent upgrading her ice sheathing; Amundsen knew she would spend several winters iced-in. In the spring of 1902, her refit complete, Amundsen sailed her to Christiania (now Oslo), the capital of Norway. At this time Norway was still in a union with Sweden, and Amundsen hoped the nationalistic spirit which was sweeping the country would attract sponsors willing to underwrite the expedition's growing costs. After much wrangling, and a donation from King Oscar, he succeeded. By the time Amundsen returned, Norway had gained its independence, and he and his crew were among the new country's first national heroes. Amundsen served as the expedition leader and Gjøa's master. His crew were Godfred Hansen, a Danish naval lieutenant and Gjøa's first officer; Helmer Hanssen, second officer, an experienced ice pilot who later accompanied Amundsen on subsequent expeditions; Anton Lund, an experienced sealing captain; Peder Ristvedt, chief engineer; Gustav Juel Wiik, second engineer, a gunner in the Royal Norwegian Navy; and Adolf Henrik Lindstrøm, cook. Gjøa left the Oslofjord on June 16, 1903, and made for the Labrador Sea west of Greenland. From there she crossed Baffin Bay and navigated the narrow, icy straits of the Arctic Archipelago. By late September Gjøa was west of the Boothia Peninsula and began to encounter worsening weather and sea ice. Amundsen put her into a natural harbour on the south shore of King William Island; by October 3 she was iced in. There she remained for nearly two years, with her crew undertaking sledge journeys to make measurements to determine the location of the North Magnetic Pole and learning from the local Inuit people. The harbour, known as Uqsuqtuuq ("lots of fat") in Inuktitut, has become the only settlement on the island—Gjoa Haven, Nunavut, which now has a population of over a thousand people (1,279 at the 2011 census). Gjøa left Gjoa Haven on August 13, 1905, and motored through the treacherous straits south of Victoria Island, and from there west into the Beaufort Sea. By October Gjøa was again iced-in, this time near Herschel Island in the Yukon. Amundsen left his men on board and spent much of the winter skiing 500 miles south to Eagle, Alaska to telegraph news of the expedition's success. He returned in March, but Gjøa remained icebound until July 11. Gjøa reached Nome on August 31, 1906. She sailed on to earthquake ravaged San Francisco, California, where the expedition was met with a hero's welcome on October 19. Rather than sail her round Cape Horn and back to Norway, the Norwegian American community in San Francisco prevailed on Amundsen to sell her to them. The ship was donated to the city of San Francisco, and the ship was dragged up the beach to the northwest corner of Golden Gate Park, surrounded by low fence and put on display. Amundsen knew that because of the notoriety that his exploits aboard Gjøa had earned, he would be able gain access to Nansen's ship Fram which had been custom-built for ice work and was owned by the Norwegian state. Therefore Amundsen left Gjøa in San Francisco. He and his crew traveled back to Norway by commercial ship. Of the original expedition members, only Wiik failed to return to Norway, since he had died of illness during the third Arctic winter. Over the following decades Gjøa slowly deteriorated, and by 1939 she was in poor condition. Refurbishment was delayed by World War II, and repairs were not completed until 1949. Being displayed outdoors and having faced 66 years of high winds, ocean salt and sand, the boat once again suffered deterioration, until in 1972, with the help of Erik Krag, a Danish American shipping company owner of San Francisco, Gjøa was returned to Norway. 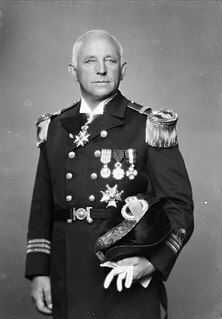 Erik Krag was knighted by the King of Norway for his efforts in shipping home Gjøa. 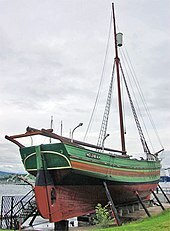 The Gjøa was displayed in the Norwegian Maritime Museum (Norwegian: Norsk Maritimt Museum) in Bygdøy, Oslo. In May 2009 the Norwegian Maritime Museum and the Fram Museum (Norwegian: Frammuseet) signed an agreement for the Fram Museum of Bygdøy to take over the exhibition of the Gjøa. It is currently displayed in a separate building at Fram Museum. A bauta (memorial pillar) now stands near Gjøa's former home in San Francisco. The Gjøa was also featured as a filming location in the 2005 documentary, The Search for the Northwest Passage, in which Kåre Conradi played Amundsen. Roald Amundsen told the story of the exploration of the Norwest Passage in two volumes entitled Die Nordwestpassage. Meine Polarfahrt mit der Gjöa 1903 - 1907. the material was translated into English as The North-West Passage: Being the Record of a Voyage of Exploration of the ship "Gjøa" 1903-1907 (Ams Press Inc; June 1908, ISBN 978-0-404-11625-5 and reprinted Kessinger Pub Co, November 30, 2007, ISBN 978-0-548-77250-8). ^ Statistics Canada. 2012. Gjoa Haven, Nunavut (Code 6208081) and Nunavut (Code 62) (table). Census Profile. 2011 Census. Statistics Canada Catalogue no. 98-316-XWE. Ottawa. Released October 24, 2012 (accessed May 20, 2014). ^ "Gjøa-Ekspedisjonen (1903-1906)". The Fram Museum. Archived from the original on 2015-09-06. Retrieved December 1, 2016. RCMPV St. Roch is a Royal Canadian Mounted Police schooner, the first ship to completely circumnavigate North America, and the second vessel to transit the Northwest Passage. She was the first ship to complete the Northwest Passage in the direction west to east, going the same route that Amundsen on the sailing vessel Gjøa went east to west, 38 years earlier. King William Island is an island in the Kitikmeot Region of Nunavut, which is part of the Canadian Arctic Archipelago. In area it is between 12,516 km2 (4,832 sq mi) and 13,111 km2 (5,062 sq mi) making it the 61st-largest island in the world and Canada's 15th-largest island. Its population, as of the 2011 census, was 1,279, all of whom live in the island's only community, Gjoa Haven. Gjoa Haven is a hamlet in Nunavut, above the Arctic Circle, located in the Kitikmeot Region, 1,056 km (656 mi) northeast of Yellowknife, Northwest Territories. It is the only settlement on King William Island. Maud, named for Queen Maud of Norway, was a ship built for Roald Amundsen for his second expedition to the Arctic. Designed for his intended voyage through the Northeast Passage, the vessel was built in Asker, a suburb of the capital, Oslo. The Fram Museum is a museum telling the story of Norwegian polar exploration. It is located on the peninsula of Bygdøy in Oslo, Norway. The Norwegian Maritime Museum is located at Bygdøynesveien on the Bygdøy peninsula, on the western side of Oslo, Norway. The Norwegian Maritime Museum is situated near several other museums, including the Fram Museum; the Kon-Tiki Museum; the Norwegian Museum of Cultural History; and the Viking Ship Museum. The Norwegian Maritime Museum is operated in conjunction with Norwegian Folk Museum.